There have been quite a few Minimates reviews as of late on this site, as well as a surprising number of Teenage Mutant Ninja Turtles reviews. So, now for something slightly different. The next couple of days are going to be Marvel Legends related. Fun fun fun. Today, I’ll be looking at Carnage, a figure that eluded me for a while and led me to go off on one of my angry rants. Fortunately, today’s review is rather free from ranting. ….Yay! 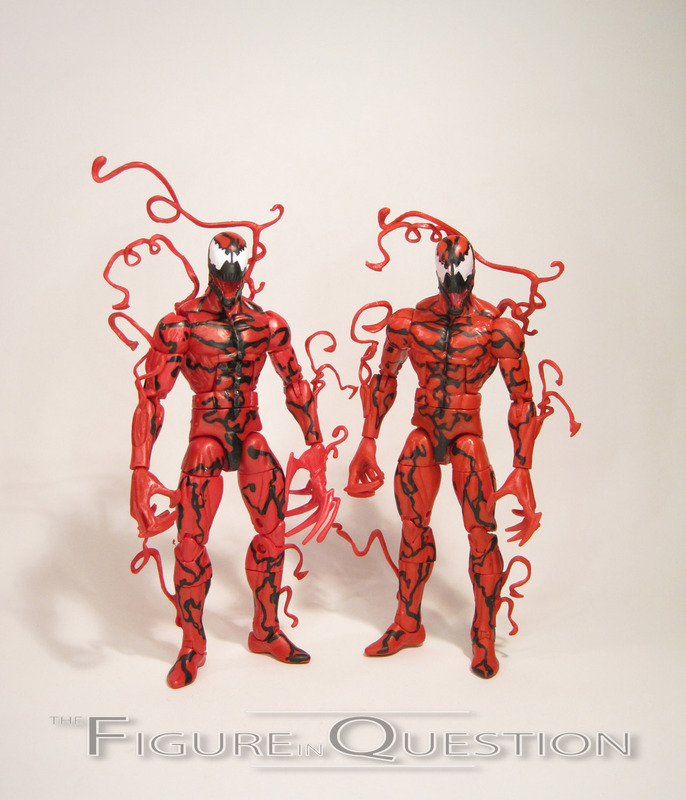 Carnage was released as part of the Amazing Spider-Man 2 Marvel Legends Infinite Series. His official name within the context of the series is “Spawn of Symbiotes,” a name he shared with Toxin, who replaced Carnage in later shipments of the series. It seems Hasbro has flipped back again, resulting in a plentiful supply of Carnage once more. 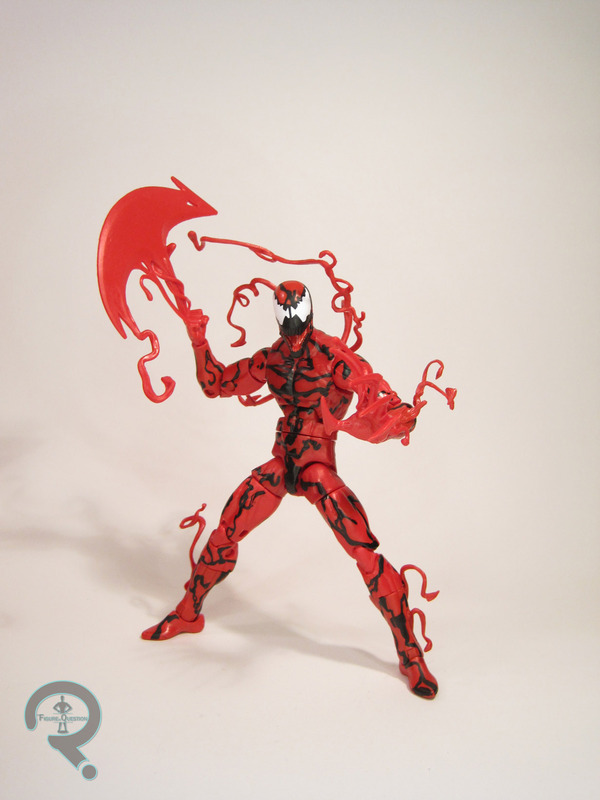 Carnage is about 6 ¼ inches tall and he features 32 points of articulation. 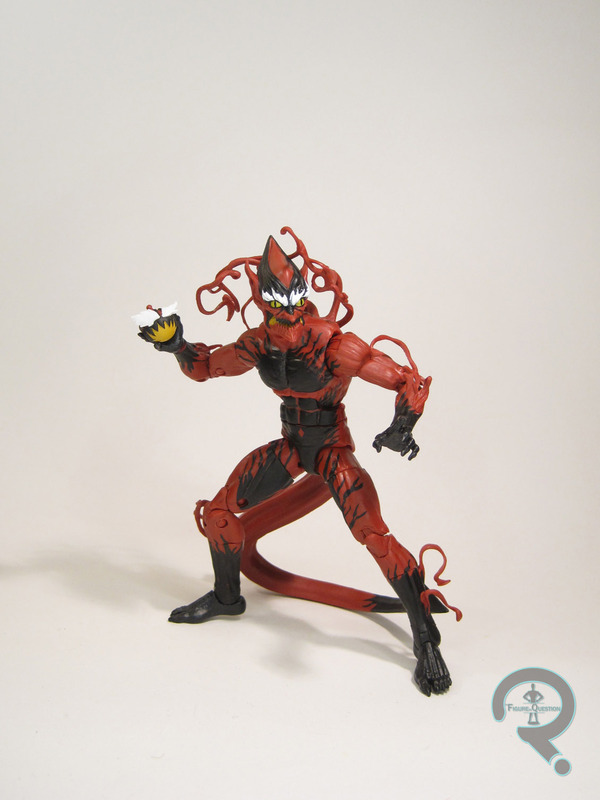 This figure depicts Carnage as he’s best known: bright red and covered in tendrils. The figure makes use of the current standard mid-sized body Hasbro’s been using, which first cropped up on their Bucky Cap figure from a few years ago. There are a few minor issues with it (I’m still a bit weirded out by the veins right at the start of the shoulders), but overall it’s a pretty great base body, and it’s a definite improvement on the ones we’ve seen in years past. The figure’s lower arms and legs have been tweaked to allow for the attachment of Carnage’s trademark tendrils. The transition from limb to tendril could be a bit smoother, but it’s not so jarring as to ruin the figure. As far as new pieces, Carnage gets an all new head and hands, as well as another tendril attachment which plugs into his back. The head is a fantastic piece, and it really captures Carnage well. The hands are just basic spikey, clawed hands, but they do that well. The tendril piece is alright, but it seems to have been slightly malformed by the package, so it’s always hanging in his face. Carnage’s paint is a lot cleaner than a lot of recent Hasbro figures, but I feel it’s also not quite as interesting. It’s not bad, but it seems just a touch too simple. 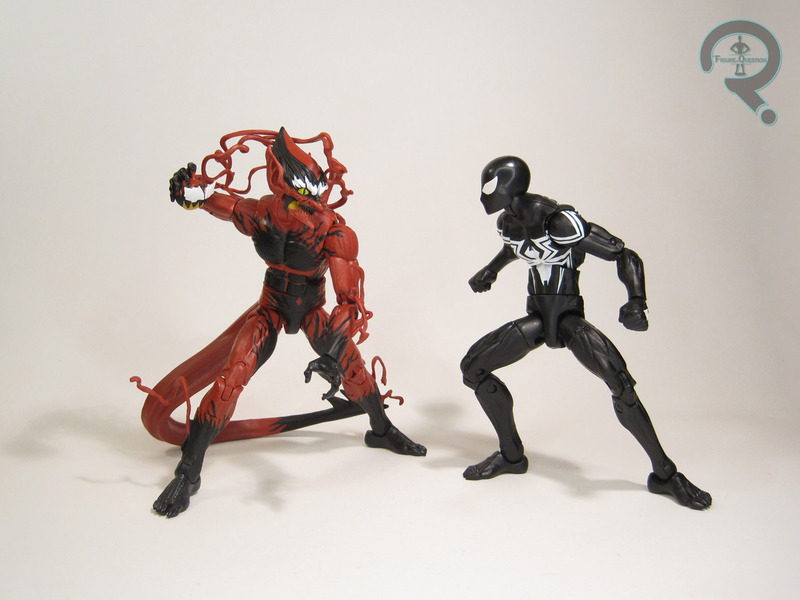 Previous Carnage figures benefited from the symbiote’s texture being sculpted, which is less of an option in this day and age. Still, the black details could be a little more interesting. Carnage, or rather, Spawn of Symbiote is packed with the head and, uh… back flames (?) of the series Build-A-Figure Ultimate Green Goblin. After much searching and a run in with my sworn nemesis, The Scalper!, I finally was able to track down Carnage at a K-Mart in a town I was visiting while my mom and brother were doing a run (Incidentally, it’s the same K-Mart where I got my Teenage Mutant Ninja Turtles Minimates). I’ve only ever been a moderate fan of Carnage, but for whatever reason, this figure just really appeals to me. He’s a solid design, and a pretty solid execution. I just wish he’d been a little easier to find. One of the greatest rogues galleries in comics is the Spider-Man rogues gallery. When you take into account that his main competition for that spot is Batman, a character that has been around for an extra 20 years, it’s a pretty impressive feat. With Minimates, getting Spider-Man’s rogues proved a bit tricky. Thanks to the multi-pack format, each spider-villain was bound to be packed with yet another variant of Spidey. However, Diamond has been getting more inventive with their sets, and just recently, they finally offered a set of Spider-Man villains with no Spider-Man included. Okay, it’s all figures with previous figures, but it’s the gesture that matters! This set was released in the title “Deadliest Foes of Spider-Man.” It was originally meant to be one of two exclusive sets carried by Action Figure Xpress, but they had to back out, leaving the sets in limbo. Minimate retailer Luke’s Toy Store stepped up and picked up this set as an exclusive to their store. Carnage is the most recent character in this set, though he’s still over 20 years old, so I guess he’s still a “classic.” Generally, he’s not as well-known as Venom, the other Symbiote villain, but Venom has gotten his fair share of Minimates recently. The original Carnage Minimate from way back in Series 2 is generally considered to be one of the best of the early Minimates, so he’s definitely a tough act to follow. The figure is about 2 ½ inches tall and he features 14 points of articulation. Carnage has only ever had one basic look, so the figure unsurprisingly makes use of that look. He makes use of the basic Minimate body, with non-standard upper arms, a tendril add-on piece for the neck, a tendril hand, and an axe hand. The upper arms and neck piece were both previously seen on the “Venom: Through the Ages” Ann Weying. Since that figure was released, there’s been a campaign for those pieces to be used for Carnage, so it’s good to see that finally pan out. The hands are both brand-new, and they work pretty great for the character. I do kinda wish the tendril wasn’t quite as straight, but that’s a minor complaint. The big focus for Carnage is his paint. This was the strongest area of the very first Carnage, and I’m happy to say this one has surpassed him. The paint work on this figure is truly outstanding. Virtually every surface of the figure is covered in detail, which is not something you usually see on Minimates. Carnage includes an alternate Cletus Cassiday head (which re-uses the hair from Ghostbusters’ Janoz), an additional tendril hand, two claw hands, and a clear display stand. Otto Octavius, aka Doctor Octopus, is probably the best known of the villains in this set. He’s also kinda dead right now, but his stint as the Superior Spider-Man just ended, so he’s still on everyone’s mind. The last proper Doc Ock Minimate was in the “Friends and Foes of Spider-Man” set from a few years ago. However, that set was riddled with horrible quality control, so Ock was in dire need of an update. The figure is about 2 ½ inches tall and features 18 points of articulation, courtesy of the extra arms. The figure is based on Ock’s classic green and yellow spandex look he sported throughout the 70s and 80s, which is the same look seen on both of his previous Minimates. The figure is built on the standard Minimate body, with additional pieces for his hair, torso, and his mechanical arms. These are all new pieces, and they are all really great for the character. The paint on Doc Ock is pretty good, though it could be a little better. The actual detail work is really great. Ock’s face is spot on for the character, and all the colors and such look just right. Unfortunately, the application of the yellow paint is rather sloppy, which is fairly distracting. It’s not enough to ruin the figure, but it is a little annoying. Doc Ock includes a spare set of lower arms which allow him to stand on them, and two display stands to facilitate this. Curt Connors, aka The Lizard, is probably one of Spider-Man’s more tragic foes. He only becomes The Lizard due to his desire to grow back his missing right arm, and The Lizard is a personality entirely separate from his own. Curt Connors was a minor character in two of the Sam Rami Spider-Man movies, and The Lizard served as the primary antagonist in the first Amazing Spider-Man, so the character is certainly well enough known. He’s had one comic Minimate before, back in Series 37. That one was based on his design from his earlier appearances, whereas this one is meant to be based on his appearances in the 80s and 90s. The figure is about 2 ½ inches tall, and in his default set up, he has 12 points of articulation. The Lizard is built on the same Minimate base as the other two, but he features a different set of lower legs, as well as clawed hands, a lab coat, and a slip-over lizard head. The lower legs originally saw release on the Movie Lizard in Series 46, and the coat was originally used on the Series 37 Lizard. Near as I can tell, the head and hands are new. The reused pieces are sensible, though I’m not 100% sold on the lower legs. They seem a little off. The head is better than I thought it would be. Prototype pictures made it look far too large, but in person it looks about right. The paint work on the Lizard is pretty good overall. He doesn’t have any real issues with slop, but it would be nice if there was a little bit more detail on the head, especially on the teeth. The Lizard has the best accessories assortment in the set; he includes a hair piece (re-used from the “Captain America: Through the Ages” Armored Cap), a lab coat and an alternate half arm (both from the Amazing Spider-Man Doctor Connors), an extra hand, and spare legs, allowing him to be converted into a comic-styled Curt Connors. The parts are excellently chosen, and fully assembled he’s a spot-on Connors figure! Sandman is an early Spider-Man villain, but he’s had a more varied history than most. After fighting Spider-Man a few times, he joined up with the Fantastic Four villains The Frightful Four for a little while and then he even joined the Avengers, before once again returning to Spider-Man’s rogues gallery. Most notably, he was one of the villains in Spider-Man 3, which contributes a lot to his notoriety amongst the more casual fans. Sandman is no stranger to Minimates; he’s had two previous comic-styled Minimates and two Minimates based on his film appearance. The figure is about 2 ½ inches tall and features either 14 or 4 points of articulation, depending on how you set him up. He’s overall based on the character’s classic design, though I’m not 100% sure when he had the short sleeves. Right out of the box, the figure only makes use of the standard Minimate head and torso, with non-standard arms, and a sand base in place of his legs, as well as a sculpted hairpiece. The arms and sand base both were previously seen on the Series 18 Sandman, and the hair was first used on the Thunderbolts set’s Norman Osborn. The sand pieces work great, but I’m not sold on the hair. I didn’t particularly care for it on Norman, and I think it’s even less fitting on Sandman. It’s just too bulky to look right, especially in the back. The paint on Sandman is really great. All the base work is nice and clean, and the details are all really sharp. The face has just the right look for Sandman, which is great. Sandman includes spare arms and a regular lower half, allowing for him to be displayed as Flint Marko, as well as a clear display stand. Like yesterday’s “Days of Future Past” set, I picked this set up from Luke’s Toy Store. Not that it should be a shock, what with it being a LTS exclusive and all. I’ve been pretty excited for this set pretty much since day one. It’s a really great set, and it fulfills several needed figures. Lizard is definitely my favorite, with Carnage not far behind. Were the QC on Ock a little better, I’d probably like him more, but as is, he’s a good update to an essential character. Sandman is the weakest in the set, mostly due to him being the only one with no new pieces and his look being a little off. Still, he’s not a bad figure, so I can’t complain. All in all, this is one of the best sets of Minimates put out this year, and that’s really saying something. So, if you’re a Spider-Man fan or a Minimate fan, or just a fan of good toys, head on over to Luke’s Toy Store and pick this set up. It’s worth it!